SanDisk improves its Connect Flash Drive, which can connect up to eight devices. SanDisk upped the capacity of its thumb-sized Connect Wireless Flash Drive, which can stream to multiple devices at once. The 64GB Flash Drive is a 28.3-gram thumb-sized device, nearly small enough to go on a key chain, that takes a microSD card and sets up a Wi-Fi network. It can connect up to eight devices and stream up to three simultaneous playback streams without the need for an Internet connection. It can receive and send data from a smartphone to a tablet and other devices, and the network can be encrypted with standard Wi-Fi protocols to keep it secure. SanDisk is billing the new drive as a handy way to share and store across different devices, as well as a memory expansion for when a smartphone or other device is reaching its storage capacity. "We're excited about this new category, specifically the form factor as the ease of use is the key thing," said Dinesh Bahal, vice president of product marketing at SanDisk during a demo at Storage Vision 2014 ahead of CES. "Literally I can load up the app, turn on the product, it automatically switches the network and everything is there -- the ability to look at files, folders, videos, photos, music separately and then play from there." SanDisk had to build a product with an exFAT (Extended File Allocation Table) filing system to accommodate microSD cards beyond 32GB -- 64GB is the current upper limit in microSD cards globally, according to Bahal, but the device could accommodate a 128GB card. 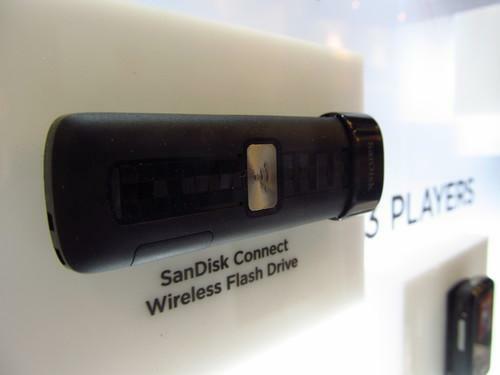 Rechargeable via its USB interface, the Flash Drive has a four-hour battery life versus nine hours for SanDisk's Connect Wireless Media Drive, a larger device with an SDHC/SDXC card slot that was also announced last summer. The Wireless Media Drive can stream five different HD movies simultaneously and is geared toward heavy multimedia use, while the 64GB Flash Drive is more of a portable memory extender. The Flash Drive is selling on Amazon.com for US$99.99.